On Sunday, the Baltimore Ravens faced off against the Oakland Raiders. In what was supposed to be a blowout, the Raiders surprisingly kept it close. The Ravens got off to a bad start and allowed the Raiders to put seven on the board on the first drive of the game. The Ravens recovered from this blunder but were unable to pull away from the Raiders until the fourth quarter. The Ravens almost fell into a trap, and it left many fans leaving M&T Bank Stadium wondering the same thing, “How was the game that close for that long?”. To answer this question, one must take a look at the game tape. The Ravens defense was the first to fall into the trap. Baltimore played sloppy defense on the first drive of the game, as the Oakland Raiders marched down into the end zone and scored a touchdown without much opposition. The Raiders caught the Ravens off guard by utilizing a combination of screens, misdirection, and tight end target plays that resulted in a long and sustained drive down the field. Jon Gruden essentially took every he knew the Ravens would have trouble defending, and threw them all at Ravens defensive coordinator Don Martindale. The Ravens are notoriously bad at covering tight ends, especially when caught off guard. Gruden made sure to abuse this weakness, as he dialed up four tight end passes on a 12 play drive. The Raiders also utilized a double reverse run play, screens, check-downs and run plays. The Ravens defense acted like a deer in headlights throughout the first drive. Baltimore’s defense tightened up after the first drive woes. While the defense played well as a whole, the secondary stood out the most. The Ravens played tight and fast defense, not allowing Oakland quarterback Derek Carr to beat them through the air. Cornerbacks Jimmy Smith, Brandon Carr, and Marlon Humphrey each made plays and provided tight coverage throughout the day. As the game progressed, it became increasingly harder for Derek Carr to make passes. The Ravens even had plenty of opportunities to force turnovers. Outside linebacker Terrell Suggs swatted down a Derek Carr pass at the line of scrimmage but was unable to catch it for an interception. As the defensive backs tightened up the coverage, there were instances of plays where they had an opportunity to grab the football, but none were able to do it. Baltimore’s defense started to click in the fourth quarter. The defense moved from good to great once it began to pounce on opportunities. At the start of the fourth quarter, the Ravens were up by just three points, and the defense had yet to make a big play. As if someone flicked a switch, the Ravens defense suddenly burst into playmaking mode. Outside linebacker Matt Judon strip-sacked Derek Carr creating Baltimore’s first turnover since October. Terrell Suggs picked up the fumble and returned it 43 yards for a touchdown. The Ravens not only cured the turnover drought but suddenly applied real pressure to the quarterback, something Baltimore has struggled to do in recent weeks. The Raiders offensive plays immediately following Judon’s strip sack resulted in not one, but two more sacks by Judon, for a total of three in a row. The defense shut down the Raiders offense and created big plays to put Baltimore in the win column. Like the defense, the offense struggled at the start of the game. The Ravens seemed fixated on proving that Lamar Jackson could be an NFL caliber passer. Instead of asserting this, the Ravens offense sputtered. Restricting Jackson to a pass-oriented scheme hurt the offense as a whole. Jackson’s first half was marked by indecision and inaccuracy. He often missed throws and made bad reads on others. Drives would stall out, and the Ravens had a difficult time putting points on the board. Jackson finished the first half completing only 50% of passes. He was 9/18, for 140 yards. Jackson’s biggest pass went for 74 yards to Mark Andrews. That drive, however, stalled out after Jackson was called for a delay of game. The Ravens were forced to kick a field goal. Jackson’s average yards per pass attempt was 7.78 yards, but if the 74-yard outlier is removed, it was only 3.88 yards. Jackson also tossed two interceptions. The first came as Jackson forced a pass into triple coverage. The ball was tipped and intercepted. The second came when Jackson tossed a fade route to Michael Crabtree in the end zone. The ball was behind Crabtree, tipped by the defender, and caught by another. Baltimore realized that the pass-heavy approach was not working, and moved to a run-oriented scheme in the second half. Lamar Jackson passed the ball just seven times in the second half. This is a 61.11% decrease in the number of passes. When Jackson’s pass attempt numbers dropped, his efficiency spiked. He completed 71.43% of passes in the second half, for an average of 5.43 yards with no outlier. Jackson also scored two touchdowns in the second half, one on a run, and one on a pass to Michael Crabtree. These touchdowns were followed up by no turnovers. The Ravens replaced the passing scheme with a running one, powered not only by the dual-threat Lamar Jackson but rookie running back Gus Edwards as well. An undrafted rookie, Gus Edwards received the first starting nod of his career on Sunday, after a remarkable performance the previous week. Edwards rushed for 115 yards on 17 carries against the Cincinnati Bengals in week 11. In week 12, Edwards again hit the 100-yard mark, with 118 yards on 23 carries. Edwards is the only Ravens rusher to accumulate 100 yards in a game this year and has now done it twice in a row. Edwards was an invaluable addition to the Ravens offense against the Raiders. He took pressure off Lamar Jackson and created big plays to drive the Ravens offense down the field. Special teams also was key to the Ravens victory. The offense struggled to put points on the board early, but special teams filled in the gap. Not only did Justin Tucker kick two field goals, but the group scored a touchdown. Earlier in the game, he took one for a substantial gain, foreshadowing the play he broke in the second quarter. Cyrus Jones caught a punt at the 30-yard line, followed the blocks, made some defenders miss, and returned it 70 yards into the end zone. Jone’s punt return is the first Ravens special teams touchdown on the year. The Baltimore Ravens came close to falling victim to the fabled trap game. Both the offense and defense struggled early on in the game. The defense quickly recovered, while the offense shuffled its way into the second half. By the second half, the offense changed its gameplan and became much more efficient. The defense also turned a leaf and began making plays for the first time in a long time. 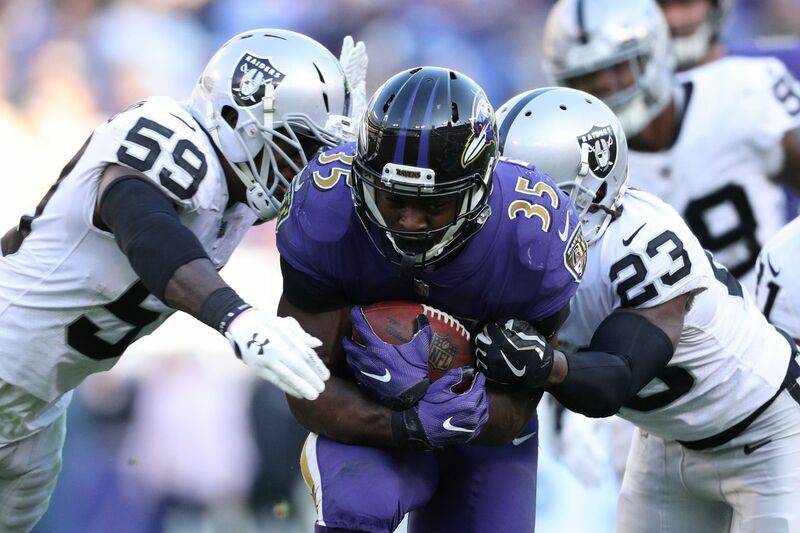 The Ravens seemed unprepared and unfocused to play an Oakland Raiders team desperate for a win, but Baltimore regained their senses in the second half. The 34-17 victory places Baltimore firmly in playoff contention, with just five weeks remaining in the season.